Nirvana Bar continues the great hotel bar tradition of smooth sophistication with a spirited edge. Maverick mixologists shake things up with an inventive cocktail menu, perfectly complementing the enduring classics. 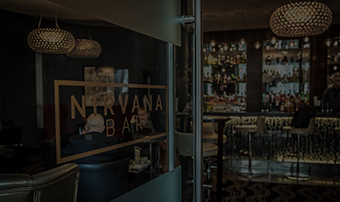 Champagnes, fine wines and one of London's best selections of single malt and blended whiskeys makes a fine match for the delectable bar bites and sharing plates from the chefs of Nirvana Kitchen. Live music into the weekend begins with jazz every Wednesday, creating an animated ambience perfect for unforgettable evenings.